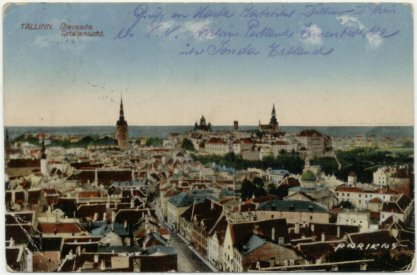 With the independence of Estonia Tallinn became the capital and the most important sea-port of the new republic. 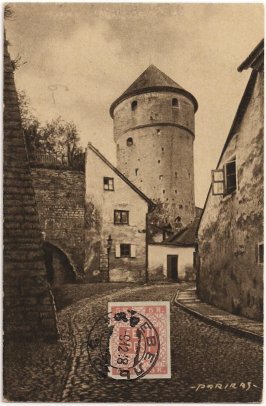 The book 'New masters of the Baltic' (about 1921) (see literature) about Tallinn:"The ancient city of Reval has stood at the western entrance to the Gulf of Finland for seven hundred years." (p. 60). 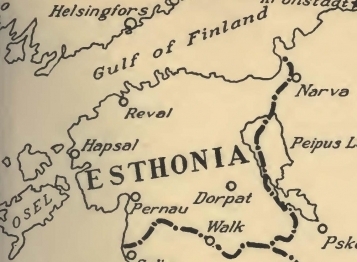 Tallinn on the map here -also from this book is located in the north-west. On the map here is used the old name Revel. The name of the city was Revel from the 13th century to 1917. On the card here below is used an old Russian postmark with the old name РЕВЕЛЬ [REVEL]. 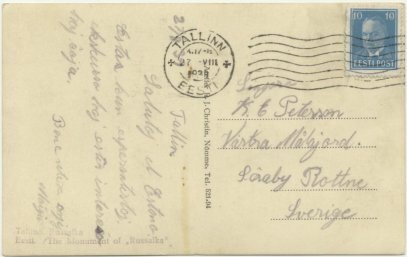 The postoffice of Tallinn is opened November 16, 1918. 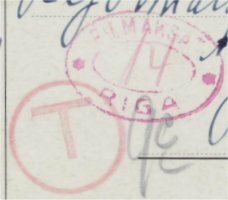 In the period 1918-1919 provisional Estonian cancellations were used. 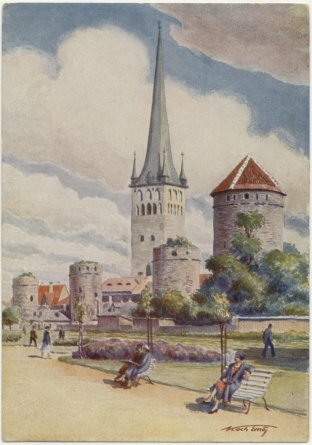 This card is sent within Tallinn on -7 12 18. 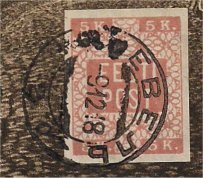 As provisional postmark is used a stamp from the former Russian era. In the handbook EESTI the provisional Estonian cancellations are divided in 4 main groups: stamps from the former Russian era (type 14A), manuscript cancellations (type 14B), locally prepared stamps (type 14C) and uniform stamps (14D). The old Russian stamps -as on this card- are subdivided: here type 14A7, double circle date-stamp, Russian place name. There are 10 different provisional cancellations of Tallinn reported. The postage stamp is the first Estonian postage stamp: in kopeken, 5 k (Michel no. 1), see above. 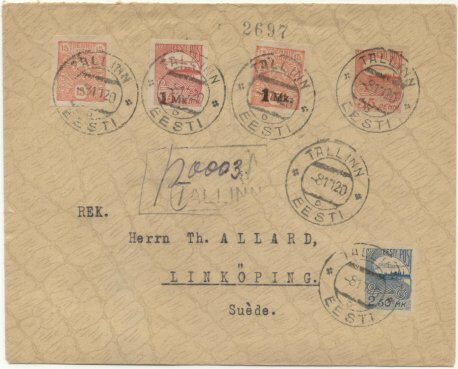 The postal rate for an inland postcard was 5 kop. from November 15, 1918. On January 1, 1919, it changed: 15 penni, the new currency (1 Estonian Mark = 100 Penni). 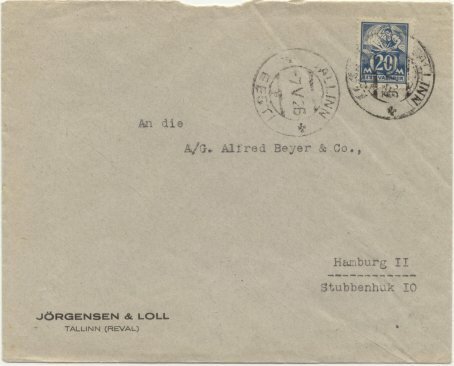 On this cover 1920 is an early Estonian double circle date-stamp used, code 'D': a former Russian date-stamp with the month in Arabic numeral. It is the subtype with two crosses between the circles (type A1 above). The same subtype is reported with code 'b', 'B', 'C' and 'E', 'F', 'G'. 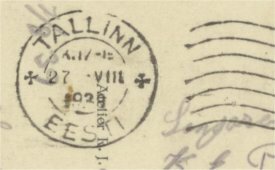 This postmark from 1926 is main type B: double circle date-stamps, month in Roman numerals. The indexletter is P: according the handbook EESTI postmarks with this indexletter are known as type B1 (two crossen between the circles) and B4 (between circles Maltese crosses). Here we are dealing with type B1. The 'Baltische Bahnhof' (Baltic railway-station) is the main railway-station of Tallinn. 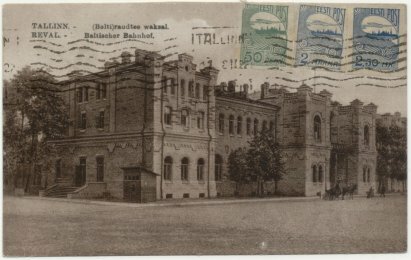 The station was build in 1870 after the finishing of the Baltic Railway (Paldiski-Tallinn-St.Petersburg railway). The station is opened oktober 24, (according new calender 5 november) 1870. The station building is set on fire by retreating Soviet troops in 1941 and almost complete destroyed. After the war the building is partly rebuilt. The present station is built between 1960 an 1966 in 'Soviet-style'. 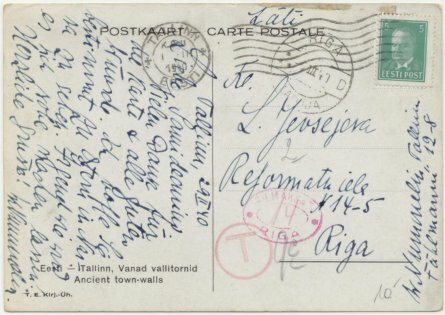 The postcard is sent to Riga, but insufficiently stamped: a to pay postmark of Riga. 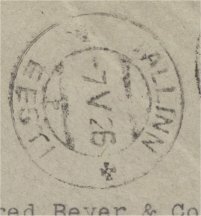 Machine postmark of Tallinn, type E2 according EESTI-handbook (wavy lines, 24-hours system, no text). On the picture the ancient town-walls. 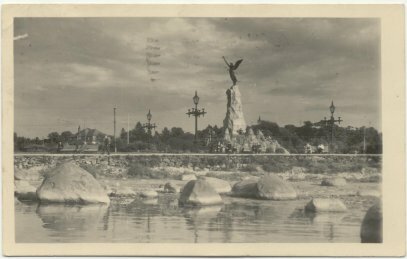 On the picture-side of this postcard: statue 'Russika'. This Memorial, a bronze monument , erected on 7 September 1902 in Katharinental, in Estonian Kadriorg, in that time near Tallinn (now outskirts), to mark the ninth anniversary of the sinking of the Russian warship Rusalka, or "Mermaid", which sank en route to Finland on September 7, 1893. The angel is holding an Orthodox cross towards the assumed direction of the shipwreck. About the ship: see Wikipedia.